This was the Month of Kale, apparently. The Swiss chard I've been staying on top of-- each of my plants is a tidy little knot of rainbow-colored stems sprouting fresh new leaves-- but my kale is getting holey, ragged, and damn enormous. So once the green beans were done, early in the month, we started eating kale. It's not a bad thing, really. We like kale. Sometimes I make kale slaw with a very tangy Caesar-style dressing (mayo, olive oil, lemon juice, Dijon, parmesan), but most of the time it gets sauteed or thrown into soup. Above is something I call "California Kale," a big pile of kale steamed in a skillet with garlic and a splash of soy sauce, and a sprinkling of raisins. 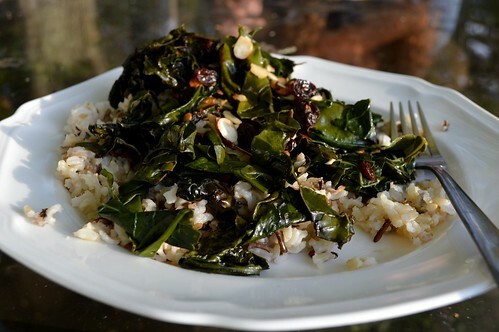 The raisins plump, the kale gets tangy and delicious, and a shower of almonds caps it off nicely. Early this week our good friend and former neighbor Jen (see here) came to visit, for the first time in three years. As in, she hadn't seen Gilbertsville yet! So, it was quite a joy to go around, to show off the chickens and the garden and the house and the town. I love playing tour guide. I also love cooking for company, especially now, when so many good things are so wonderfully improvisable. Early in the afternoon, I threw a big pan of halved tomatoes drizzled with oil into a 300 degree oven, and took the frozen tart crust and some pesto out to thaw. We (and the Del) took a long walk around town. We came back. We picked up a basket full of apples, from the ancient tree in our side yard. I added oats, flour, maple syrup, butter, and made an apple crisp. Then, we cut kale, and I sauteed the kale with shallots and garlic, and a splash of vinegar at the end. I mashed one of those roasted tomatoes into half a stick of softened butter, and that was divine. The rest of them I layered into the tart shell, and topped with beaten eggs and a luxurious sprinkle of smoked mozzarella. My cooking style has changed so thoroughly, and I love the changes. Everything used to be store-bought, from the eggs to the kale to the apples. We used to buy things like ricotta salata and fig jam and fresh pineapple. It was lovely. It was a nice style to embrace. But this one here is so much more fun, and more fulfilling. And less stressful-- I'm more likely to throw things in a pan than I am to follow a recipe. Cooking feels freer, because I've mostly let go of anything really involved. 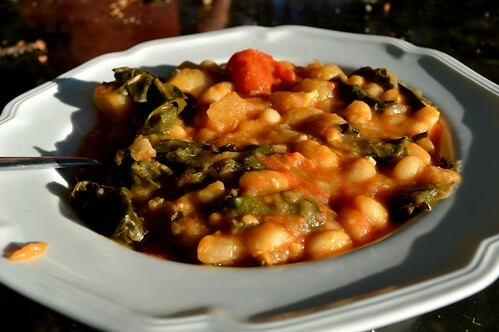 This (not very photogenic thing) was white bean and kale soup with potatoes and smoked paprika. I am soo happy to welcome back soup weather. Talk about stress-free cooking. Throw things in a pot. Cook until done. 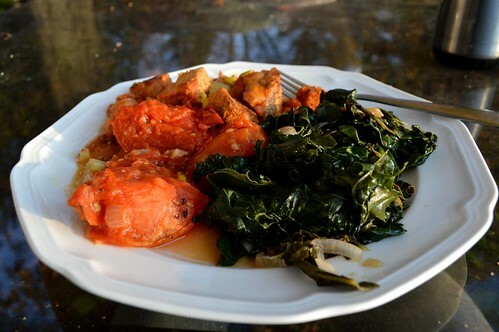 Last but not least (AGAIN with the kale...) scalloped tomatoes. Not the most healthy or virtuous dish to grace our table this month (but California kale made up for it, I hope) but in my opinion the most delicious. 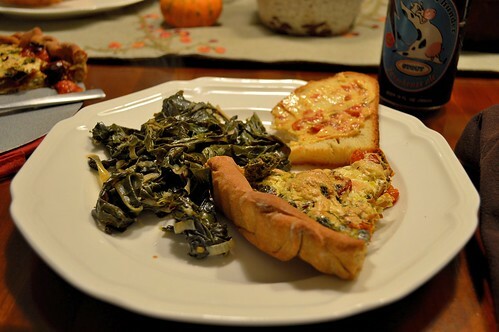 This was a big staple in our house when I was a kid-- a terrific end-of-tomato-season dish. It's comfort food-- of course-- for me now, the one thing I make Just Exactly Like My Mom Did, something I think I could eat for the rest of my life. I mean, like, if they don't serve scalloped tomatoes in heaven, then I'm not interested in heaven. Like that. I believe I have made them on-average once a week this month, and I'm sure I have a pan or two more up my sleeve before the bitter end. Now, roll on, October! Roll on butternut squash soup and roasted roots and soup, soup, soup! The california kale sounds wonderful! I've been eating a kale salad (chopped kale, brocoli slaw, craisins and poppyseed dressing) and if I'm really ambitious we have that over shredded cauliflower -> last night's supper actually! Ah, such perfect timing! Was just given a bunch of kale. Never eaten of fixed it before and here you are with your ideas and success stories! Yay! Thank you! Shelley-- that meal sounds amazing!